I, TONYA is a gripping, deeply moving, and beautifully put together account of the infamous Olympic figure skater Tonya Harding and the events that led to her ex-husband hiring a goon to knife Tonya's rival Nancy Kerrigan. Those of us of a certain age will remember the circus and the ensuing drama of Tonya's Lillehammer performance. It was a massive trashy story told with no nuance - a true tabloid scandal. It pitted a nasty, white-trash, jealous cheat against an all-American princess - the kind of elegant, pretty figure that figure skating touts as the perfection of womanhood. This long overdue retelling focuses firmly on Tonya and tries to give some shade and context and sympathy to her story. Along the way we get some laughs, but I found this to be less of a dark comedy than a pathetic tragedy. Those laughs mostly come from Bobby Canavale's cynical journalist, commenting on events with the benefit of time, and providing much of the sporting world context. The tragedy comes from the central character and strong performance of Margot Robbie as Tonya. As the movie opens, we see a four year old Tonya with a genuine passion and talent for skating pushed to excel by her emotionally and physically abusive alcoholic white trash mother LaVona. LaVona justifies her behaviour by telling herself she's toughening her daughter up, and pouring every hard earned cent into skating. 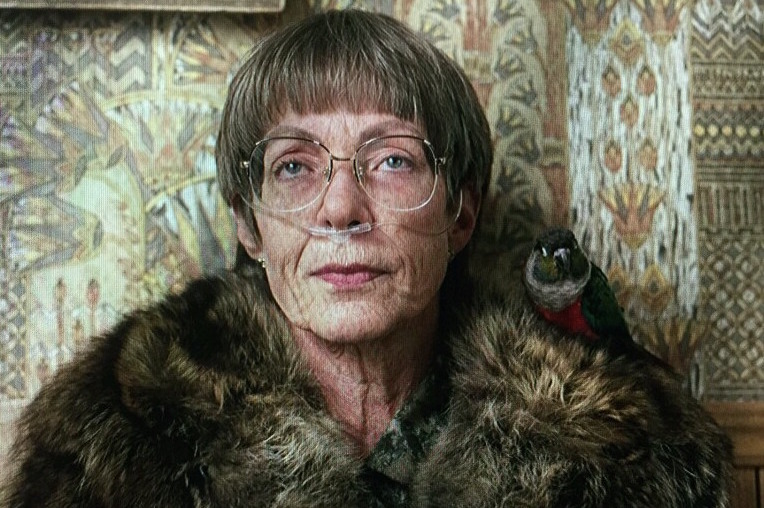 She's played with a Cruella DeVille nastiness by Allison Janney and is the most terrifying and brilliantly performed screen mother since Livia Soprano. No amount of superbly hilariously ugly 1980s hairstyling can obscure the sheer malevolent selfishness of her character. Unsurprisingly, the victimised Tonya takes the first path of escape she can find, but jumps out of the frying pan into the fire with her feckless, physically abusive husband Jeff Gillooly (Sebastian Stan). What's so scary about this character is how quickly Stan can take this fairly innocuous man from calm incompetence to violence and back. The film doesn't shy away from showing the abuse, and it's truly horrible to watch. And so we have a Tonya who is suffering from an horrific home life, and drinks and smokes to escape it - who isn't at her physical peak - but remains a great skater. But like her mother, although she'd never agree with that, she's happier blaming others for her misfortune. So when she gets bad scores it's not because she's ill prepared but because the judges hate her. Of course she's right in thinking that, but as the film shows, it's easier for her to think that's the whole rather than partial story. Tonya, drinking, smoking, with her tacky hair and costumes, is just not the image that American Ice Skating wants to portray. Kerrigan is just safer, more banal, and more easily digestible. The tragedy of the story is that maybe, just maybe, Tonya could've turned it around. She did leave her husband, and did train for Lillehammer. She was the first and only American skater to successfully land the triple axle. We'll just never know. Because as shown here, her husband decided to freak out Kerrigan by asking his friend Shawn (Paul Walter Hauser) to hire some goons to send blackmail letters, just as Tonya had received. Shawn turns out to be the real delusional and morally vacant centre of the plot - he takes it upon himself to switch from blackmail letters to stabbing Kerrigan in the leg. Indeed, as the film depicts it, Gillooly was basically guilty of conspiring after the fact rather than before. And Tonya's role is treated very ambiguously - she knew about the letter plot, but not the stabbing, and basically just wanted to skate. What I got from the film is that this was a girl who was just not going to succeed - she was abused her whole life, and caught up in a plot she didn't care about. What you can hold against her is her unwillingness to take responsibility for her actions - not just with "the incident" - but in general. The film benefits from strong performances throughout - with Robbie and Janney exceptional. The attention to detail on the wigs and costumes and room settings is amazing. And the way in which Robbie is CGI'ed into performing the most complex skating moves is superb. But most of all I loved the way that director Craig Gillespie (LARS AND THE REAL GIRL) kept the skating scenes, and indeed all of the scenes, really kinetic and energised. Indeed, with his hand-held camera-work up close and in the characters' faces, the film had a brutal intimacy to match the subject matter. I also loved the choice of making this a film about memory and self-awareness as much as anything else. By using characters as talking heads commenting on their own past actions; and by having characters break the fourth wall; we learn how far they are or aren't contrite or moved. The result is a very powerful and insightful take on a tabloid story - one with far more depth than I had expected. I, TONYA has a running time of 119 minutes and is rated R in the USA and 15 in the UK for very strong language and scenes of domestic violence. The film played Toronto 2017 and opened last year in the USA and Canada. It opens on Jan 18th in Hong Kong; on Jan 25th in Greece, Estonia and Lithuania; on Feb 1st in Denmark, Hungary, Russia, Singapore and Norway; on Feb 9th in Mexico; on Feb 14th in Sweden, Argentina and Brazil; on Feb 23rd in Belgium, France, the Netherlands, Spain and the UK; on March 1st in Germany and on March 15th in Australia.